A dense, compact shrub with slender red branches in the winter. The abundant white flower clusters become white berries in early summer. 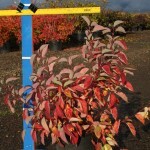 Foliage turns dark purple-red in the fall. It is tolerant of a wide range of soils, but does better with summer moisture. Prune to remove older stems and encourage new growth. Useful for naturalistic plantings, a low hedge, or mass planting.